Before you do anything on this page make a full backup of all files you care about !!! Windows 10 Crashes on HP x360 Envy with the 2500u Processor – Vega 8 Video Driver. Stability is so poor that the computer is nearly unusable. Crashes are more prevalent if you try to watch video on Facebook or YouTube. Brave and Firefox have similar setting. I have the ultimate fix for Chrome. Don’t disable hardware acceleration, that’s just crazy and inefficient. Open up “chrome://flags” in the omnibar, search for ‘ANGLE’ and you’ll find the ‘Choose ANGLE graphics backend’ flag. Simply change this to OpenGL, then click the relaunch now button at the bottom of the page. Yes, this really does resolve all Chrome crashes – everything from fancy animations to video rendering resolved. It seems the root cause is actually in the DirectX 11 handling between Chrome and Vega drivers. OpenGL doesn’t suffer any of the problems and actually brings higher performance, so it’s a win-win! * If you happen to do any design work you may find that this fix causes unexpected problems with some of the development software and plugins. The driver provided by windows update and HP is 22.19.665.1. You can download a none vendor specific version from the microsoft repository – Version 23.20.816.0. Reports are that this version also isn’t perfect, but it is a massive improvement over what comes loaded on the machine. https://www.catalog.update.microsoft.com/Search.aspx?q=vega%2023 (This is a newer version I’m testing)…. 23.20.827.0 – So far so go. This driver worked really well. I only had one lockup in a week and it may have been unrelated to the video driver. https://www.catalog.update.microsoft.com/Search.aspx?q=23.20.841.1024 During the install my screen went black and didn’t come back on. I gave it a few minutes to make sure it finished the install process and rebooted the computer by holding down the power button. The computer booted up without issue and seems stable. https://www.catalog.update.microsoft.com/Search.aspx?q=24.20.11016.12001 Giving this one a shot. The time stamp is older but the version number appears higher so I’m not sure what’s going on there. Install went fine. I’ve ran the last one a few months. Seems to be very stable. – No crashes that I can attribute to the video driver. I think I would stay away from the latest driver from amd. I lost the ability to dim my screen and had other issues. I rolled back to 24.20.11016.12001. – You’ll still need to install with the method described below, but you won’t need to do the extraction part. If you run the auto installer all the way through make sure you do not install the audio driver or you’re going to have a bad day (make a restore point before play with this installer). Download the .cab file and extract it with something like 7zip. – Windows doesn’t have a built in extractor that works with cab files. Once you have the files extracted into a folder you can install the updated driver. 1. Go to cortana and type in device manager. 2. Go to display adapters, expand the menu and right click on the AMD Radeon Vega 8 Graphics. 7. Browse to the folder where you extracted the driver. Click into the top address bar and copy the address. 9. Select AMD Radeon(TM) Vega 8 Graphics and hit next. Your screen may freak out while it installs the driver. (My computer actually crashed the first time I tried, but it did work on the second try). With the latest driver your screen may go black and not turn back on… Give it a few minutes before you do anything to the computer. It should boot back up with the new driver as long as you let it finish the install. The following video is close, but make sure you click “Let me pick from an available list of Drivers” If you do it the way he shows in the video it may say you already have the best driver installed. If you have Envy x360 there is also a Bios update that helps things…. The bios update does take awhile to install and for some reason it screwed up my face recognition, but I was able to reset it without a problem. Awesome man.. This actually works. I have an Acer Swift 3 with Ryzen 2500U. The graphics driver was crashing very often, but after I changed it with the drivers given above, the system has become pretty stable and it hasn’t crashed yet. Thanks for this. i have the same model and stuck with the same problem. I did the above steps but I am unable to select the extracted folder as it is saying, the folder selected doesn’t contain a compatible software driver for your device. You system didn’t crash at all after that? I have followed the above steps but I am stuck with selecting the extracted folder in ‘have disk’ option. its saying ‘The folder selected doesn’t contain a compatible software driver for our system’. (ryzen 5 redeon vega 8 mobile)is the name of my AMD graphics. 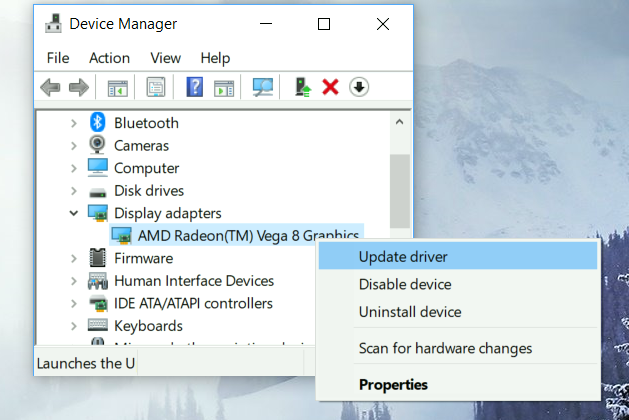 You can download an updated driver, let’s say https://support.hp.com/us-en/drivers/selfservice/hp-pavilion-15-cw0000-laptop-pc/20284015/model/22399619, execute the file and, then, follow the steps of above noted. Just, when looking for the drivers, go to C:\SWSETUP\SP88882\base as your source directory to install AMD Radeon Vega drivers. Hi, i have the same model, have you solved the problem? The computer is very stable if you use the last version I mention. I have the same laptop put in an m.2 drive and it SCREAMS! But this darn GPU driver is pathetic. In my testing it was not really ready for release – and it appears there was a LOT of features in the AMD control panel that have been removed intentionally. Some PPL have had success tricking the laptop into accepting the actual Vega 64 driver but in my attempts the OS refuses to take it and spits it out. The BIOS update should fix 85% of the random crashes but they will still happen. Its most frequent for me watching youtube Chrome/Firefox (same results) and doing other things. This Ryzen 2500U im sad to say is poorly cooled when under even a 50% workload. I got a 2-5c improvement putting arctic silver 5 on but with a weak fan theres only so much. BTW the stock thermal paste was pathetic and only touching half the CPU – obviously was installed by machine. Im in California and its almost a 100f here and taking my laptop outside and watching youtube will bring the CPU into the 90c range and massive thermal throttle. My biggest problem is the banding with colors using anything GPU accelerated. I know the display is 6bit but this is like videos from the late 90s in games kinda limited color banding. (think 8 bit 256 color video). Any news on a better driver? The one posted here improves stability but performance drops by 35%, to a point websites lag. I just checked a few days ago and the last one is the latest one I could find. How much ram do you have? I have to have around 300 tabs open before I start to notice on sites. The site you are using is probably poorly coded or is trying to use the video driver. Make sure to disable hardware acceleration in your browser. HP assistant now offers an updated graphics driver for win10 1803 (it reports as being 17.7 adrenaline addition) , the file is sp88731.exe and is not listed for me on HP’s website (there I only see sp88730.exe, which behaves like an incomplete driver package – it won’t fully install). The 88731 fixed all issue for me it seems (no stuttering or scrambled video, no youtube crashing and other forms of instability so far). I take that back, the driver that got installed is the old sp83831, I guess installing it over the new sp88730 is what has made the difference. Also, video acceleration now works correctly in chrome (CPU utilization ~10% @ 1,4GHZ for 1080p videos) so be sure to re-enable it in chrome ( I had to disable it, restart chrome, then enable it again for it to start working for fullscreen videos also after driver update). I still see some very subtle bending but it’s almost gone. (when comparing to one of the first drivers which had zero bending visible, later there was one version with terrible banding that looked like 16bit colors in Windows95). Nice writup man! I’m on driver version 23.20.826.3072. I get black screen when I try to play a YouTube, sometimes I get BSOD when I open reddit.com (autoplay gifs are the culprit). I solved it by disabling “Hardware accleration” in Chrome but this hurts the scrolling very bad. Can you recommend a stable driver? Looks like you are running an even newer version than what I have. I think I’m going to stick with 23.20.841.1024 for now. I haven’t really noticed a scrolling issue, but I’ve got 32GB of ram in my machine so maybe that’s what’s helping. I occasionally notice a stutter on reddit, but this machine is mostly for work so I don’t run into some of the problems other people do. Since installing 23.20.841.1024 I have only had some issues when trying to encode video. For regular day to day stuff, I have solved the problems. HP released a new GPU driver, it’s still a 17.x driver not the latest 18.x adrenalin drivers. Please let me know of about this driver. When I tried to install it, it messed up my Windows…. My system’s running on the same driver you’ve mentioned but it seems that battery life took a hit after installing it.Does it happen to you? I’m not sure. I mostly use my laptop as a desktop replacement. I rarely run on battery more than an hour. Battery life on this laptop is poor to say the least. HP released a new GPU driver, it’s a 17.x based driver and not the the latest 18.x adrenalin addition drivers. The version number is 23.20.826.1792. I tried to install this version by removing the currently installed driver, but it messed up my Windows somehow. Let me know if you any improvement by this official driver. Used 24.20.11016.12001 as per your instructions and the BSODs for VIDEO_TDR_FAILURE / atikmpag.sys no longer happen. I’m sorry to hear that. You’ll probably need to boot to safe mode and install the factory driver for your laptop. What is the model number on your laptop? I had an error after installing the F.19 version of BIOS, but I succeeded in the way you told me. Thank you. Had the same crash problems with HP Envy 360 amd graphics driver. No matter which version of driver installed, random crashes, unable to use Netflix at all. Fixed it by installing fresh copy of windows 10 downloaded from microsoft, no HP software or drivers. Do not connect to the Internet until install is complete to ensure installation of Microsoft graphics driver. When you do connect later, Windows will update to the current amd graphics driver giving you problems again. Then you go to the driver in device manager and “roll back” to the previous microsoft driver checking box saying it doesn’t work. You won’t be able to adjust the brigtness with this driver but the computer will now run smooth and stable. Sleep mode will not work, so I set mine to turn off when closing the lid instead. Microsoft driver has these issues, but better than crashing and lagging mouse. You don’t have to worry about a license key from not using your recovery files because Windows10 auto activates on a licensed computer. Hi! Thank you for the article, that pointed me in the right direction on how to fix my laptop. Yesterday i’ve installed the F.17 BIOS, then the 19th December Adrenalin driver. That solved the gaming / video playback crashes. The Envy Ryzen5 2500U is a disaster. HP are at fault. They have made no progress .upto now . since the machine received its first reviews which reported driver problems and could not recomend until sorted. That was in 2017. They still list the incompatable 22.19.655.1 video driver on there web site. This is also installed automatically by windows update. As soon as any video is detected and graphics hardware is triggered the machine crashes with this driver. Switching to just using software video coding in the browswes allows some operation. Loading the defalt MS driver also allows basic operations. After loading the the basic MS driver you can update to 23.20.841.1024 from MS. This works but you must switch of windows updates by setting your wifi to metered connection on each wifi you use. HP claim to be working on this and AMD have admitted the diaster and say will fix it in 2019. New 13inch models have video driver 23.20.821.2560 but they have “system firmware” problems ,device cant start code 10. Nice… This seems like it probably works. ‘Select the device driver you want to install from this hardware’ stage. I’m worried that wrong selection may brick-up my feeble and fastidious RYZEN-ed envy x360 so I’m delaying the installation. Big thanks for all the efforts anyways. 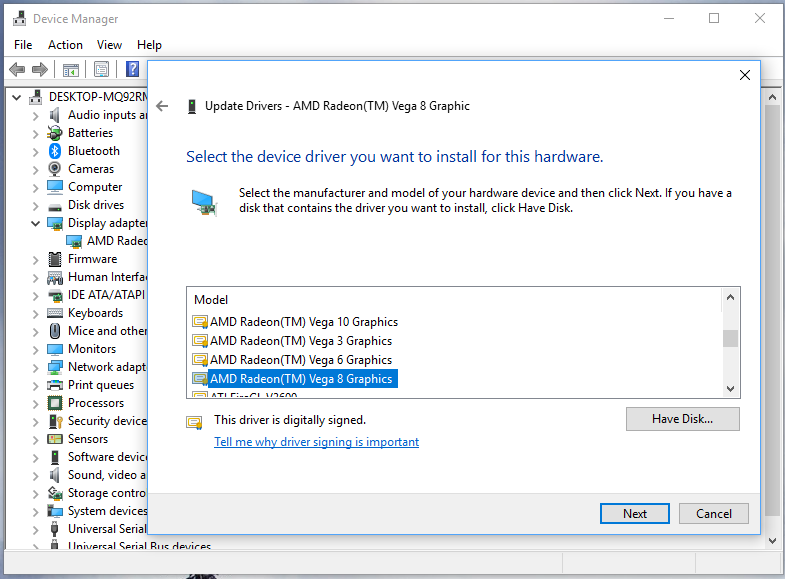 When I try installing 25.20 driver it shows same two “AMD Radeon(TM) Vega 8” options. Is there any way to make this proper as the above screenshot displays? I tried this today on my HP Envy x360 Conversion and it solved the problems I’ve had since the day I bought it. Thanks!